Global Winter Wonderland is an incredible holiday experience happening at Cal Expo from November 18 through January 7. If you’re looking for a modern twist on classic Christmas magic, bring the whole family to this entertaining display. Truly one of the most impressive holiday displays in the region, Global Winter Wonderland combines cutting edge technology, top-notch entertainment and fantastic exhibitions for one heck of a show. The event is put on by the International Culture Exchange Group, headed up by founder Lulu Huang. When Huang moved to the U.S. as a teenager, the native Chinese executive desired to plan a spectacular representation of various cultures representing diverse California. The Global Winter Wonderland has been shown in Santa Clara, Atlanta and now Sacramento – known as being one of the most culturally diverse cities in the nation. The Worlds of Light section is the most popular destination at the Global Winter Wonderland. The Global Village features the world’s greatest structures illuminated with countless lights. Exhibits include the Eiffel Tower and Russia’s St. Basil Cathedral. After you’ve visited the illuminated beauty of world travel, head over to the Holiday Fun section for snowmen, reminder and more representing Santa’s village. For a complete change of pace and to thrill your little ones, check out the Dinosaurs exhibit, where these legendary species are iit up in one impressive comeback. 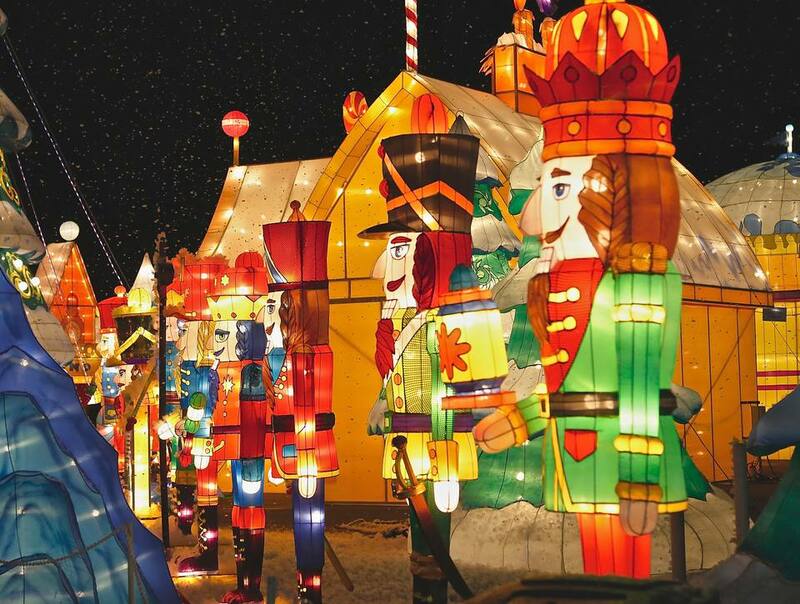 The Worlds of Lights also features a rich history of Chinese lantern festivals and nightly entertainment, rides, shopping and international foods that rotate on a nightly theme. Entertainment is as diverse as the event’s visitors, featuring the Circus of Light. These acrobats, jugglers, fire dancers and contortionists from around the world will amaze you with their performances that happen on stages around the park every single night. There are musical guests, too. Rides and games are also available at Global Winter Wonderland, featuring over 30 options. Rides require 3-5 individual tickets (approx. $1 per ticket), or you can purchase an unlimited ride wristband. Both thrill and family rides are available, and it’s a great way to enjoy Global Winter Wonderland both at night and before the sun goes down. From the pickiest eater to a true culinary adventurer, there is something tasty for everyone in the food area. There is also a full bar featuring imported spirits from around the world for guests over the age of 21. Vendors come from all over the world to showcase their artisan crafts and special goods representative of their home nations. These traveling individuals will provide the opportunity to purchase truly unique and captivating holiday gifts for everyone on your list. Every week of Global Winter Wonderland comes with elaborate theme days appropriate for the entire family. Check their website for the most up-to-date schedule. As of September 7, 2017, ticketing information is not yet available for the 2017 event. Check the tickets section of the website for most updated information. Global Winter Wonderland is open weekends early December through early January.